On Saturday, Nigel and I went into St. Mary’s Church, Penzance in order to photograph two banners.Unfortunately I had “lost” the charger for my digital camera and the battery was flat, so we had to resort to a disposable camera! While Nigel was sorting out some music (he is the organist) I walked around the balcony. I always loved this church, it feels warm and almost homely, slightly crumbling around the edges. 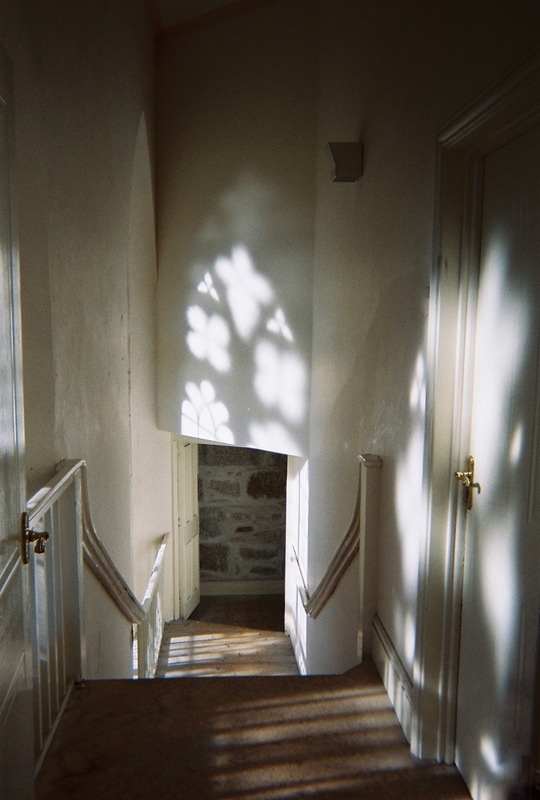 It was around midday and the light came in from the east, soft and gentle, casting delicate shadows. I was taken by the gentle, calm atmosphere. Just stepping one thought back: somewhere in my work, not always obvious, was/is a search for incorporating an aspect of spirituality. I grew up in a Protestant church community and worked in Germany for 15 years for different protestant organizations. Since my early 20’s I have been on my journey to find my own “spiritual” home. Spirituality is an important part of my life, not necessarily religious belief. But being in this church and taking part in the church community has given me a physical space, a community and with that a kind of framework. This is only a beginning of a reflection, just a noting of first thoughts. It is less than two months since it has become part of my life again. 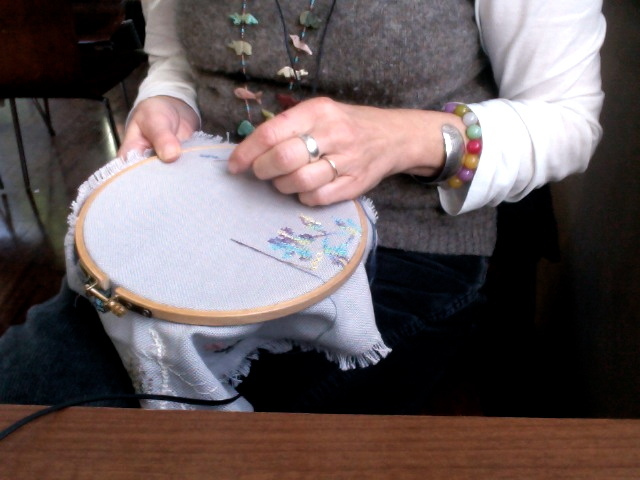 While I was walking around, the church taking photos, the idea came to start with filming me in this space, embroidering, while listing to music.Working with Textiles has always these two aspects to it, the solitary retreat into something which comes close to meditation and the social situation of being in a group ( knitting groups, working with friends, etc.) At this moment it was the idea of capturing the reflective meditative moment.